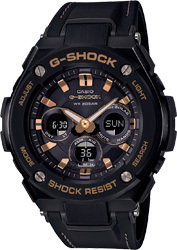 From G-SHOCK, the watch brand that is constantly setting new standards for timekeeping toughness, comes a selection of new designs for the expanding mid-size G-STEEL lineup. The bands are made of synthetic tough leather material combined with highly wear-resistant resin. Tough leather material is stitched around a resin core to create a surface that provides plenty of protection against impact while being fashionably elegant. The combination of metal cases and leather bands results in functionally elegant timepieces that look great with a wide range of casual fashions. Functions include Tough Solar powered operation and Full Auto Double LED illumination for improved readability in the dark. 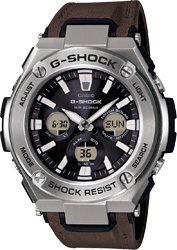 A layer guard structure, and a new type of leather greatly enhance design possibilities for these new G-STEEL models.